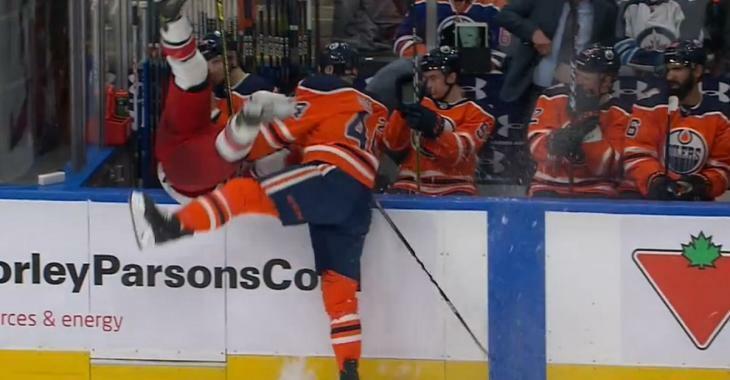 Videos : Kassian sends Martinook into the Oilers bench with a big hit! Kassian sends Martinook into the Oilers bench with a big hit! Big time hit sends Martinook into the bench. Just my personal opinion but hockey could use some more of this type of old school hockey mentality. On Sunday night the Edmonton Oilers were taking on the Carolina Hurricanes and things got off to a real bad start for the Oilers in the contest. The Hurricanes got out to an early lead during the game's very first period and although the Oilers did manage to cut the lead down by adding a goal of their own at one point, the Hurricanes always had a stronger response. Through the first half of the game it did not really feel like much of a game at all with the Oilers needed nearly 10 minutes to get their very first shot on goal, although not everyone on the Oilers roster was looking to sit back and coast to a loss. In fact during the second period with his team trailing by a score of 4 - 1 Edmonton Oilers bruiser Zack Kassian tried to spark some life into his team by using some of his very best attributes, his physicality and his outright brutality. The gritty Oilers forward punished Carolina Hurricanes forward Jordan Martinook with a big body check in the opening minutes of the game's second period and the hit was a pretty spectacular one. It wasn't a particular outstanding body check but the fact that the hit was delivered with enough force to send Martinook sailing right into the Oilers bench certainly did add plenty of flare to his big hit, and Kassian wasn't done there. In case there was any doubt that Kassian was to spark some life into his team the tough Oilers forward would then send a message to Martinook, the Hurricanes, and even his own Oilers teammates on the bench. After Kassian had already dumped Martinook up and over the Oilers bench he continued to punish him on the bench by delivering what looked like a few stiff shots to the Hurricanes winger, although he may have merely been trying to shove him deeper into the bench. There were about 3 of those stiff shots in all and Martinook was quick to come over to Kassian to voice his displeasure after he regained his feet, although he didn't show any signs of wanting to challenge the Oilers big man.